I’ve had an old ThinkPad laptop lying around for ages, and for most of that time I’ve been planning to do something useful with it. It’s not very powerful (Pentium 133 with 64 MB), but its bright 11 inch TFT screen has plenty of potential. My vague plan was to build it into a picture frame as a kind of digital photo frame/information point, but it wasn’t until I found exactly the right kind of frame the other week that I really got started. Over the weekend, I stripped the laptop down to its bare essentials, discarding useless components like the floppy drive (remember those? ), hard disk, and casing. 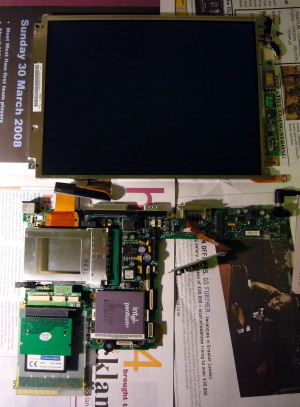 I put together the essential parts (main board, screen, power board) and managed to bring it as far as the POST screen, at which point the BIOS complained that the CMOS battery was flat. But at least it was operational, and the battery was just a standard button cell available anywhere. I’m replacing the hard disk with a Compact Flash card to make the hardware lighter and the software easier to develop, so I also ordered a 44-pin ATA to CF adapter from FleaBay for 99p (plus £3 postage from Hong Kong). It arrived today, and I was able to take the test a bit further. 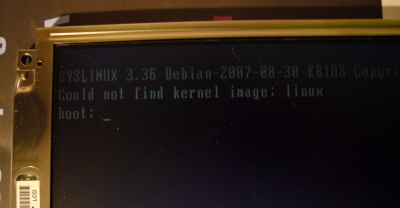 I ran syslinux on a VFAT-formatted CF card to make it bootable, slotted it into the adapter, plugged it into the hard disk connector, and started up the system. In the absence of a proper Linux system to boot, I couldn’t have expected it to get any farther, but it proved all I wanted: booting off the Compact Flash card is possible. The next step is to fit the screen into the picture frame. The glass is the right size, but the metal casing of the panel needs about a centimetre of extra clearance on one side. Since my neighbours are unlikely to appreciate the sounds of chiselling in the evening, I’m leaving that until the weekend. I know I could just buy a digital photo frame, but where would be the fun in that?